Football and drinking go hand in hand, they always have. It’s not just a cultural thing either, although that has a big part to play in it. The concept of having a drink in a favoured establishment before the game is as old as the game itself. It’s just what you do. Football fans are creatures of habit, and whether it is a superstitious thing or merely a routine source of pleasure away from the humdrum of work and the weekly chores at home, a drink before the game and a catch-up with mates is quite often the highlight of a Saturday. Certainly if that Saturday involves watching Leeds United. 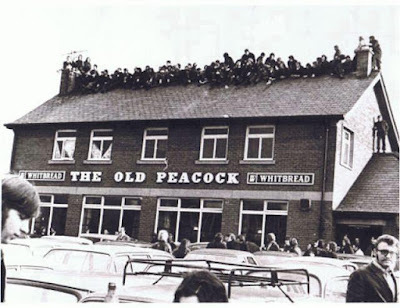 When the ‘Peacock Inn’ first appeared on a barren patch of land at the bottom of the hill leading from Beeston village in 1826, the rules of Association Football didn’t even exist, never mind Leeds United, who would appear as a by-product of Leeds City’s expulsion from the Football League some 93 years later. In the 19th century pubs were very much a working class domain. When the Peacock opened its doors for the very first time, Beeston had an estimated population of just 894 people. By the end of the century this had grown to nearly 3,000 as families migrated to the area to work in the many local pits. Villages such as the nearby Islington, Hunslet and Holbeck gradually merged together and the densely populated area saw several pubs materialise to serve the growing local workforce. Football didn’t have any presence in West Yorkshire until the early 20th century; the West Riding was a strictly rugby and cricket stronghold. Several amateur clubs were playing in the area, but the Football Association were keen to make inroads into the traditional territory of their rival sports by promoting the professional game, and Bradford City arrived first in 1903, then Leeds City in 1904 and finally Huddersfield Town in 1907. We all know Leeds United’s story from there. The local pits and clay mines closed towards the end of the 19th century and the ‘Elland Road’ area was a sporting metropolis at the time Leeds United was formed in 1919, with greyhound racing, speedway, crown green bowling (on what is now the Peacock beer garden no less) and cricket all played to a high level at some stage, while the embryonic Leeds United attempted to establish itself both in the area and in professional football itself. By the 1970s it had finally done so, and the whole geographic area surrounding Elland Road had been changed accordingly. 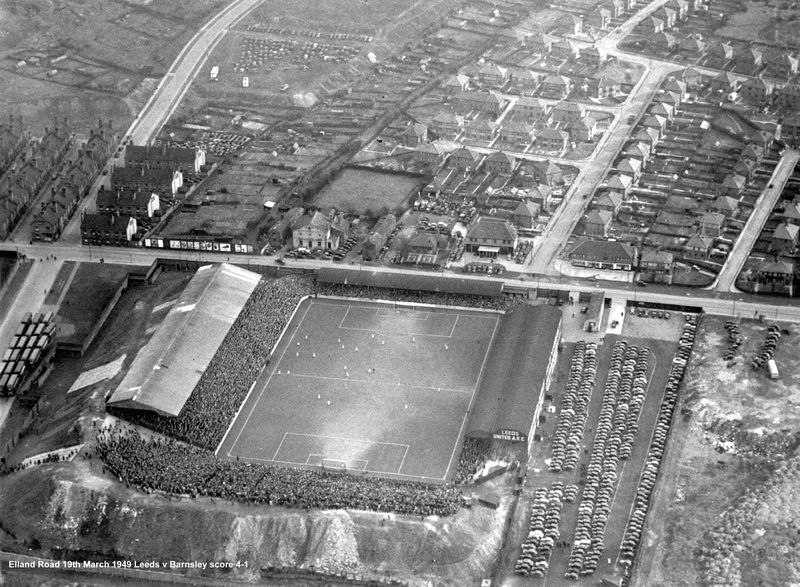 Lowfields Road was built in 1923 purely to serve as a conduit between Elland Road and Gelderd Road to transport football fans away from the ground. Also, a prime justification for the M621 passing within yards of Elland Road when it was built in 1973, was the ease of access to one of the biggest football clubs in the country at the time. It is true that the Old Peacock possibly needs Leeds United more than Leeds United needs the Old Peacock. The motorway carved the area in two and completely changed the demographic of the surrounding landscape, but the Old Peacock survived and still does. Although there is still a healthy population of around 16,000 in the Beeston area today, the pub trade is very different, and the Peacock is no longer as central to the community as it once was. That said, the Peacock’s enduring appeal transcends mere football. Local pubs are monuments to England’s industrial heritage and melancholy symbolism of an unsophisticated past; a living, still existing history book dripping in faces, smiles, stories, characters and laughter, cultural emblems built on customs and regimented but simple pleasures. Pre-match rituals and the well-trodden path between the local pub and the football ground make up much of the eternal fabric that binds fans and football clubs together. These are the bits you don’t see on Match of the Day, the bits that don’t secure multi-million pound product endorsements, the bits that existed long before Sky Sports ‘invented football’ in 1992 and pitched it to a more prosperous audience. These are the internal organs of football, which stoically continue to function up and down the country in the face of progress, and offer football fans their lifeblood at every level of the game every single week. Local pubs, local beer and local food for local people, maybe, but also welcoming those who travel far and wide for their regular fix of everything that surrounds the beautiful game, and the hearty, flavoursome goodness of life itself. Drinking inside football grounds, in comparison, is a somewhat hollow experience. Football fans have been exploited since the beginning of time, but never more so than now. Held captive for a couple of hours, choices are limited and ‘value for money’ is dismissed by the football machine as some form of unworkable Marxist theory. Football fans are held to ransom and their loyalty to the club is exploited by over-priced beer and food of dubious quality. Leeds United is not the only football club guilty of this of course, everyone does it. Throughout the country, drinking beer in concourses beneath football stands can be a depressing pastime. Clutching a freezing cold pint and framed by bare concrete walls, you stand in a dark wind-tunnel with all the hospitality of a nuclear power plant, and in a setting that doesn’t so much remind you of home and friends and comfort, but of grim, post-war Soviet austerity. You stare around not at framed photos of famous ex-players or a roaring fire, but at exposed breeze blocks, un-lagged pipework and air conditioning vents, not installed for the convenience of the rank and file supporter, but to serve the plush suites upstairs to which you will never be party. There was no licence to sell alcohol at Elland Road until 1st April 1959. But it is only in this generation that football clubs have woken up to the fact that alcohol can serve as a vital source of income. For that reason, it is surprising that the vast majority of football clubs don’t try and do it a bit better, by conducting research into what football fans like to drink or eat, and making the experience a little more comfortable, and, well, anchored in the 21st century. It all makes Massimo Cellino’s recent suggestion (in an interview with an Italian journalist) that the Old Peacock was taking alcohol sales from Leeds United more than a little perplexing. His intimation – it is widely agreed but not 100% clear – was that the marquee opened in the Peacock beer garden in the summer of 2015 had affected the club’s match day income. This has then been used as justification for the £5 ‘pie tax’ added onto the price of tickets, but only in the South Stand at Elland Road, rather than in all stands. Quite apart from the fact that the Old Peacock was selling beer nearly a century before Leeds United was a twinkle in the Football League’s eye, and exists as an independent enterprise in the Elland Road area like various other food and drink establishments, the marquee installed last summer hasn’t increased the pub’s capacity. A licence exists to hold a capacity of 1100 people on the site at any one time, and the marquee hasn’t changed that. It has just allowed people to get served quicker and easier on a busy match day. The marquee is an investment made for the comfort of the core customers; Leeds United fans. It is a result of seeing problems and listening to concerns, and through a desire to make the match day experience a better one for everybody. The feedback we have received has been very positive and consequently the Peacock is thriving as a progressive, buoyant and successful entity. Across the road at Leeds United, the mood is decidedly different, and this brings nobody with the club’s blood in their veins any pleasure. A major concern for many Leeds fans is that the current regime at the club has little interest in the foundations of what made Leeds United in the first place; the people, the area, the community, the past players, management and staff. Leeds United is built on a rich history, not always a successful one, but it is what it is because of that history. 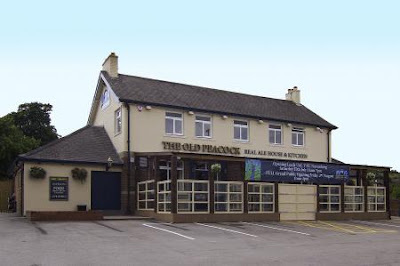 The Old Peacock is a part of that and has always harmoniously existed in tandem with the football club. Leeds fans understand that, football fans understand that. Drinking, eating, rituals, affordable choice and convenience. It is very easy to look and listen and to act upon what you see and hear; basic supply and demand principles, but providing what people actually want and how they actually want it. It’s how you survive for 190 years, and as they approach their centenary in three years’ time, Leeds United need to start doing the same.